What is a Hawaii Sublease Agreement? Hawaii Sublease Agreement: What Is It? In Hawaii, a sublease agreement is a legal document that officiates an agreement between two tenants; a sublessor and sublessee. 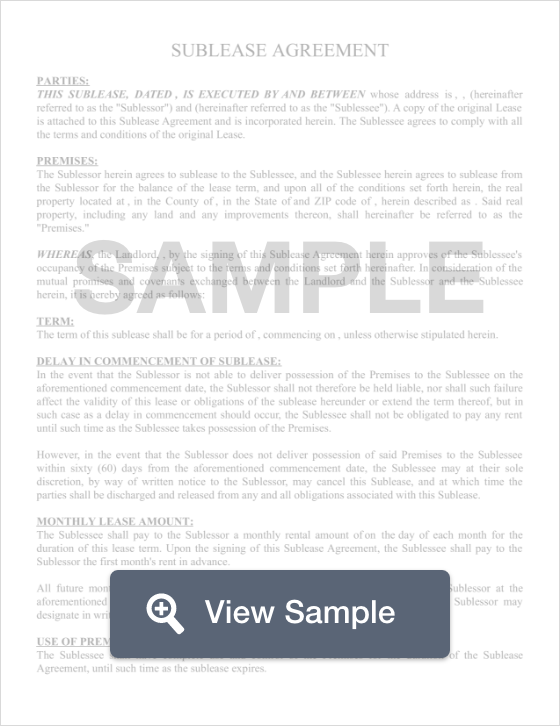 These agreements are used when the original tenant of an apartment or rental property wants to lease the apartment to another tenant. Often times, when a tenant needs to relocate or leave town for a period of time, finding a sublessee is one way to avoid breaking the lease. Breaking a long-term lease can be expensive. Doing this can cause a tenant to lose his or her deposit and incur costly fees while subleasing the unit can avoid these things, still fulfilling his or her obligation to pay rent through the end of the lease. With a sublease agreement, the sublessee will move into the unit, paying rent and residing in the unit for a predetermined period of time until the sublessor returns to live in the unit or until the lease term ends. Regardless of the terms of the agreement, it is very important for both the sublessor and sublessee to have the agreement in writing to protect both parties and ensure that both parties clearly understand the terms of the agreement. In addition, it is important for the tenant to have written permission from the landlord that permits subleasing. Regardless of who the sublessee is, the sublessor is, the sublessee will still be held responsible for any late payments or damage that occurs even while the sublease agreement is in effect, as the original tenant’s name will remain on the lease until the term ends. Tenant/Landlord Laws in Hawaii provide sublease provisions unless blatantly expressed otherwise in the lease. Tenants are encouraged to receive written permission before subletting a rental to avoid problems down the road and to protect all parties involved.